Mimaki, a leading manufacturer of wide-format inkjet printers and cutting systems, today announced that it would be exhibiting for the first time at formnext 2017, the international exhibition and conference on the next generation of manufacturing technologies. The trade fair is scheduled for 14 to 17 November in Frankfurt. Mimaki will be located in Hall 3.1, stand C88. formnext 2017 marks the first unveiling to the 3D industry of the Mimaki 3DUJ-553, the world’s first full-colour 3D printer capable of printing up to 10 million different colour combinations with ICC profiling. 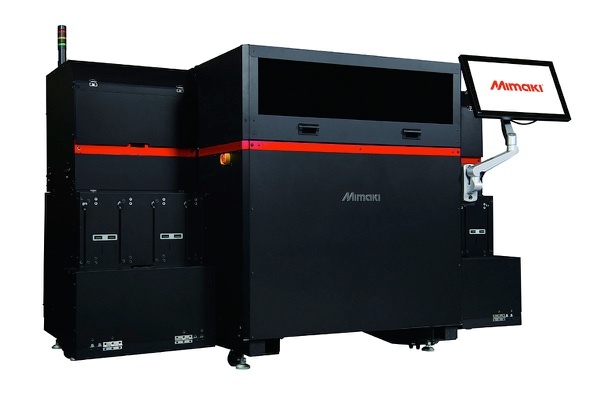 The company will also be showing the Mimaki UJF-7151plus UV LED direct-to-object flatbed printer to demonstrate their advanced UV inkjet printing technology, which serves as the base of their 3D technology. The ability to print full-colour objects with more than 10 million colours. Colour profiles can be used to ensure accurate and consistent colour. This means no overpainting is required, saving time and labour. It offers white ink, as well as a clear ink overcoat that adds vibrancy to the printed product. Its clear ink can also be combined with colour ink to create half colour transparent models. Its support materials can be removed with a simple water wash, eliminating the need to manually cut tags or other support structures. It features a maximum build size of 50 x 50 x 30 cm, larger than comparable 3D printers. Drawing upon its many years of UV-curable inkjet printing in the 2D world, Mimaki has also equipped the 3DUJ-553 with its proprietary core technologies, including ink circulation system to prevent clogging and Nozzle Checking Unit (NCU). Printhead nozzles are automatically checked for any malfunction, with an effective nozzle substitution strategy that enables continuous printing, even if a nozzle is not operating correctly. In addition, the printer is equipped with an internal monitoring camera that enables operators to monitor the progress of the printing. Also on display will be the Mimaki UJF-7151plus flatbed UV printer. Geared to on-demand printing of the very highest quality at industrial production levels of output, the UJF-7151plus is ideal for decorative printing on 3D models as well as multi-layer printing on diverse materials, ranging from plastics and glass to metal and wood. The Mimaki 3DUJ-553 is based on the same proven technology that Mimaki has successfully deployed to the market with the UJF-7151plus flatbed UV printer.